As with most works by Jackson Pollock, the emphasis for me is the feeling his work evokes from the viewer. Devoid of color, yet acutely expressive, Untitled (Page from a Lost Sketchbook) conveys aggression, disconnection, and movement. Its raw quality emphasizes the hand of the artist, thus Pollock is also present in this playlist at times—he was here, and he left a legacy. Enjoy! Feeling inspired? Create your own playlist based around works in the exhibition and send it to us at communications@phillipscollection.org and we may feature it on our blog and social media. 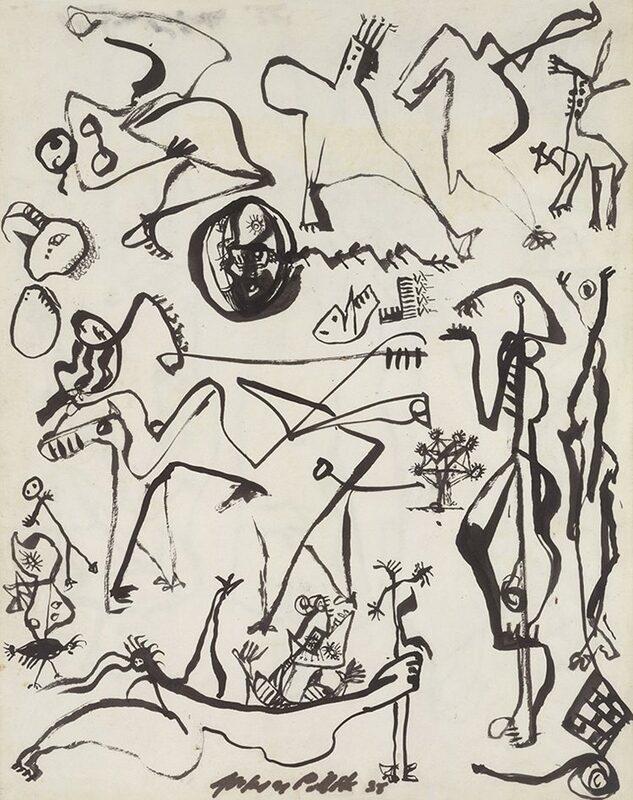 In 1930, Jackson Pollock confessed to his brother his frustration that his drawing was “rotten; it seems to lack freedom and rhy[thm].” That changed dramatically in 1944, when Pollock spent several months at Atelier 17, the printmaking workshop where he practiced the Paul Klee-inspired automatic writing taught by Stanley William Hayter. Hayter’s Atelier 17 was a central meeting place for avantgarde artists such as Pollock, William Baziotes, Adolph Gottlieb, and Mark Rothko. These three works were printed from more than 10 plates that Pollock etched over several months at Hayter’s studio. Hayter, who had seen how the method of automatic drawing had invigorated French surrealist artists, saw the potential to convert more followers among the American abstract artists. He insisted that his acolytes etch directly into the zinc plates without any preparatory sketches and call upon their unconscious to generate line drawings. Hayter’s studio became a rite of passage for many Abstract Expressionists, although it had an especially profound impact on Pollock, who took from the experience an appreciation for spontaneous, nondescriptive line. The emphasis on the physical act of making art set the stage for Pollock’s breakthrough just a few years later to his drip paintings. 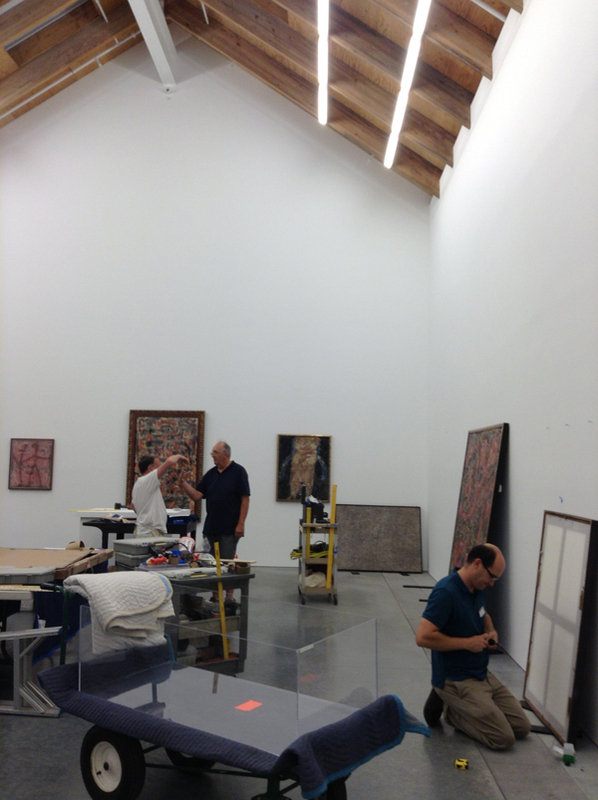 Angels, Demons, and Savages: Pollock, Ossorio, Dubuffet, being installed by staff at the new Parrish Art Museum in Water Mill, New York, last week. The Parrish is not far from Alfonso Ossorio’s Long Island estate, The Creeks, where he collected and displayed works by Pollock and Dubuffet. Angels, Demons, and Savages opened on Saturday and will be on display until October 27.